SheKnows Award Nomination – Please Vote! I am excited to learn The Petit Appetit Cookbook has been nominated for Best Cookbook for the SheKnows 2010 Parent’s Choice Awards. The SheKnows award recognizes outstanding products and services in the parenting and pregnancy industry, based on functionality, quality, convenience and best bang for the consumer’s buck. Winners will be announced Oct. 10, 2010 on SheKnows.com. SheKnows (www.sheknows.com), a destination for women with the latest news on parenting, health, entertainment and more, decided to create an award program with an organic approach to recognizing various brands and services within the parenting industry. The awards spread across 100 different categories covering everything from parent’s gadgets and kids’ books, all the way to baby feeding and toys. The goal of the award is to give readers all the information they need to make the best informed decisions in their everyday lives. You’ll recognize many of your favorite products you use every day. I know many of my favorites are there, including LifeFactory bottles, KidsKonserve lunchboxes, Melissa and Doug puzzles, Flip video cameras and Kiwi Magazine. Please cast your votes for The Petit Appetit Cookbook ,as well as your other favorite products, to help spread the word to the SheKnow community of moms like you. To vote, go to SheKnows Parent’s Choice Awards and sign in. Find the category, (to vote for my book, choose “Food”). Scroll to find the subcategory, such as “favorite baby food cookbooks”. Click on “The Petit Appetit Cookbook” to highlight and scroll to the orange “submit your vote” button at the bottom of the page. That’s it. You can do it once, every day (o.k. only if you’re my mom). Posted on August 13, 2010 Categories Lisa Barnes Blog, UncategorizedTags award, Baby Food, cookbook, SheKnows1 Comment on SheKnows Award Nomination – Please Vote! 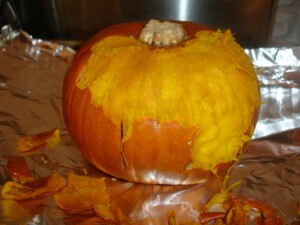 While our carved Halloween pumpkins are gone, we were delivered a beautiful 3 lb sugar pie pumpkin in our veggie box. My son said “let’s make pie!” He doesn’t really get that the pumpkin is just one ingredient in a pumpkin pie. I said we’d bake the pumpkin but not today. Well it was a whole week until “not today”, became “I better cook this thing”. It is really easy to cook and make fresh puree, however to be honest 95% of the time, I buy canned organic pumpkin. (Nutritionsist say the vitamins and nutrients are the same for canned pumpkin vs fresh and that’s why I don’t bother.) But it is fun. Plus now with the thought of BPA lining in canned goods, I thought the health scales are tipping to homemade. You can cook the pumpkin whole if a small pumpkin (3 – 4 lbs). If using a larger one, cut in half or quarters and place cut down on oiled baking sheet. Set oven to 350F. Line a jelly roll pan with aluminum foil and lightly oil. 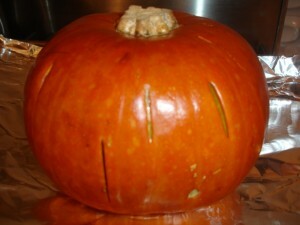 Pierce whole pumpkin with a sharp knife. Bake pumkpin in oven 1 – 1 1/2 hours or until knife pierced through to seeds easily. When cool enough to handle, peel away the skin using your fingers or a paring knife. 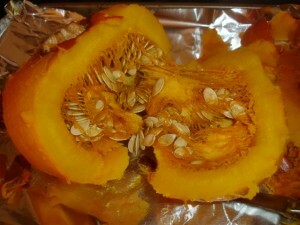 Cut pumpkin in half and scoop out seeds and fibers. Place pieces of pumpkin flesh in a food processor fitted with a metal blade and porcess until smooth. It make take a few minutes of processing and then stopping to scrape sides for all to become blended and smooth. Advertisers and marketers are having a field day with the going green trend and making millions on labels for everything from cheese puffs, to laundry soap, to toys. Everyone wants to buy “greener” products and we simply look for a quick “seal” or buzz words – but what do they mean? Is it eco-friendly, or sustainable, or recyclable, or animal-friendly, biodegradable or “other”? I recently taught a baby food cooking class to new parents who were just starting to feed their children solids. They of course are very concerned about what goes in and around their babies – as they should be. I showed them how not only to read labels but decipher them and be careful about products marketed for babies and children. Brands our parents and grandfathers trusted aren’t necessarily helping the confusion. We discovered baby teething biscuits with partially hydrogenated oils. Turkey labeled as “natural” (however it’s legal for “natural” turkey to have been raised on a diet that included hormones, antibiotics or genetically modified corn). Typical “junk foods” (cheese puffs, potato chips) labeled as “organic” (but still no healthier due to trans fats and additives and preservatives). And the biggest shock to the class was baby food packaged in #7 plastic (thought to leach chemicals in foods) – with microwave directions! This past weekend was a helpful article in the San Francisco Chronicle about green products seals, and claims surrounding green products. We’re still so new at determining and establishing some product standards that some companies are just making them up themselves. Do we want to trust Johnson and Johnson’s “green” label conducted by an in-house team? We need to educate ourselves so we’re not caught up in the marketing tactics of large companies who just want to sell us products (healthy or not, truly “green” or not). Those of us trying to go “greener” need help as well as some time and patience to read between the lines. I found the article to be helpful which you can read here. As far as food goes, it’s just one more reason to avoid reading labels and shop for whole organic foods at the Farmer’s Market. I know we can’t always go there and they don’t have everything, but it sure makes shopping, cooking and eating easier (and healthier). The good news is that there is a federal standard for “organic” food. However staying away from processed foods cuts down on much of the label deciphering, but if you must do it keep these things in mind for “organic” food claims. *A four-digit number means it’s conventionally grown (not organic). *A five-digit number beginning with 9 means it’s organic. *A five-digit number beginning with 8 means it’s genetically modified (GM). According to the Center for Food Safety, GM foods have been in stores only since the 1990s, so we don’t know the long-term health risks, and in a 1998 EPA sampling, 29% of the foods tested contained detectable pesticides. “100 percent organic” All ingredients are organic. “Organic” At least 95 percent of ingredients are organic. “Made with organic ingredients” At least 70 percent of ingredients are organic. If less than 70% of the ingredients are organic, the word “organic” can be mentioned on the information panel, but not on the front of the package. The American Pediatric Association recommends introducing solids between four and six months of age. A few large-scale studies suggest that this timing may lower the risk of developing type I diabetes. 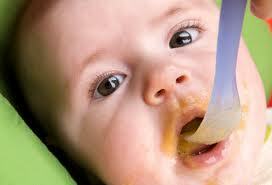 Feeding your baby solids before four months can trigger an abnormal reaction in his immature immune system. Many mothers are told by well-meaning family members to give baby solids very young in order to get them to sleep through the night. However, feeding a baby solids does not make them sleep any better. It may just coincide with other developments that encourage routine sleeping patterns at this stage. On the other hand, introducing solids later than six months may inhibit the development of a child’s palate, as they will not be exposed to enough variety early on. It is best to check with your child’s pediatrician to get the green light based upon your own child’s needs and development. 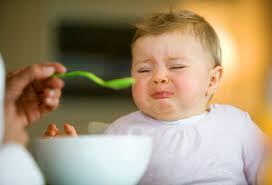 In the beginning your baby will eat about one to two teaspoons of cereal or puree, once or twice per day. Although the first few times, when they’re getting acquainted with the process, your baby won’t swallow much of anything. He is still drinking about twenty-four to twenty-eight ounces of breast milk or formula each day. Many parents, me included, look forward to introducing solids and are just waiting for the right time. But when? The biggest cue is that your child will take an active interest in watching your eat, looking at and trying to grab your food. You’ll know they’re ready when you start to feel guilty eating a meal in front of them. Babies have a natural reflex in their tongue called a thrust reflex. This is when the tongue thrusts outward to push items out of the mouth. When this reflex is gone, your baby will be able to eat because he can then swallow food. 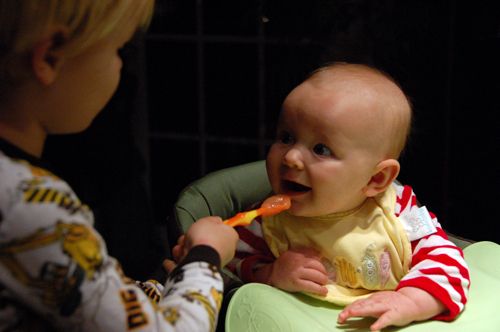 When I began my son, Jonas, on solids at five months, he still had the reflex. I would spoon the food into his mouth and his tongue would flip up, as if he wanted the spoon under his tongue. He was not yet ready to eat. However, he enjoyed thinking he was eating (though it was on his chin and spoon only) and we continued the routine. After about three days, he stopped thrusting his tongue and learned to swallow. It is best to keep a log of foods your baby has eaten. It may sound silly, but it is very easy to forget what your baby has tried or not tried. This information can be provided to your doctor in case of illness or reaction. This information can also prove helpful to baby sitters and family members who care for your baby. Foods will need to be introduced for three to five days in a row to check for any allergic reactions. Then, if a problem arises, it will be easy to determine the offending food. First foods are most likely single-item fruit and vegetable purees and cereals. In commercially prepared foods, some companies call these “Stage 1” foods. Rice cereal is the most common introductory food in baby’s culinary adventure because it’s easy to digest and isn’t likely to cause allergies. This is best purchased commercially prepared, because these cereals have an extra boost of iron, which your baby needs after six months of age. There are a few brands to choose from, with organic and GMO-free options. The cereal can be mixed with formula, breast milk, or water. Once introduced, the cereal can also be mixed with fruit, vegetable, and meat purees. Some parents think that children introduced to vegetables before fruits will not have a sweet tooth. Most nutritionists and doctors disagree with this idea. Children will like sweets. There are also many opinions about the order of food items to introduce. Some experts recommend serving vegetables in order of color—lighter yellows to oranges to lighter greens, then dark greens. This suggestion is because lighter-colored foods tend to be milder in flavor; then as your baby’s palate matures the food flavors will increase with color intensity. No one wants to waste food; however, forcing your child to eat or “finish their plate” is not advised. Before your baby can speak and tell you he’s finished eating, he will give you cues. These include: refusing to open his mouth, looking away, becoming agitated, appearing distracted, or squirming in his chair. According to nutritionist Mary Ellen DiPaola, most children can regulate their own appetites in their early stages of eating. If you force children to eat, they may lose the ability to read their own hunger and full signs. Feeding should be enjoyable for baby and parent, in a relaxed atmosphere, and at your child’s natural pace and appetite. There are a few reasons to avoid certain foods when introducing solids. The reasons include allergens, food intolerances, family history, special dietary needs, nitrite levels, and choking hazards. The biggest concern is potential food allergies and intolerances. Symptoms include rash, hives, respiratory problems, diarrhea, gas, and vomiting. Food allergies and intolerances are often linked genetically, so if parents are allergic they should be cautious and delay introducing these foods to children. Potential allergens include: wheat, cow’s milk, soy, nuts, shellfish, strawberries, and egg whites. Some foods are more likely to cause adverse reactions. Doctors agree these should not be introduced as first foods, but how long to wait is often debated. Some believe these foods should not be introduced until after one year of age, while others, such as Brock Bernsten, M.D., my son’s pediatrician, believe some of these foods, such as yogurt and wheat, should be introduced between six and eight months of age. Otherwise you may miss an important window of opportunity when children will try new foods. He cautions, however, to give these foods each day for five to seven consecutive days, rather than the typical three- to five-day recommendation. Nuts and peanuts are a special concern because of the severity of allergy symptoms affecting the upper respiratory system. Less than 1 percent of children and adults have the allergy. However, there are many processed and prepared foods that you may not realize contain nuts, including cookies, crackers, sauces, and ethnic foods. Many nutritionists suggest waiting to introduce nuts and nut butters until your child is two years old or older. I never met a baby who didn’t love sweet potatoes. They are much sweeter in taste and higher in nutrients than the basic white potato. They pack more beta carotene (an antioxidant) than any other vegetable and are loaded with fiber and vitamin A. Baking the potatoes in the oven may take longer but the flavor is much richer than steaming in the microwave or stovetop. Oven Method: Preheat oven to 425°F. Prick potatoes with a small knife, and place on a baking sheet. Bake for 45 to 60 minutes, or until tender, and skin is wrinkled. Potatoes should pierce easily with a toothpick. Set potatoes aside to cool before handling. Using your fingers, peel potato skin from flesh. Mash with a fork for thicker potatoes, or puree in a food processor with a steel blade until mashed. For a smoother and less sticky texture, add 1 to 2 tablespoons of water, formula or milk, at a time. Add liquid and process until you’ve reached desired consistency. Microwave Method: Prick potatoes with a knife and place potatoes in a microwave-safe dish. Add ¼ cup water and cover tightly, allowing a corner to vent. Microwave on High for 3 minutes and turn potatoes over. Re-cover and cook for 3 to 6 minutes, or until tender. Check for doneness, cool, and proceed with directions above. It’s all in the name. The names sweet potatoes and yams are used interchangeably in the United States, although true yams are different from sweet potatoes. Only sweet potatoes can be found in the U.S. You will notice different varieties (with varying shades of orange) in stores, most common are Jewel and Garnet. Seeing as apples are one of the most heavily sprayed conventionally grown crops, and also a favorite first food for baby, it is an obvious choice for making your own fresh, organic puree. It’s easier than you think. 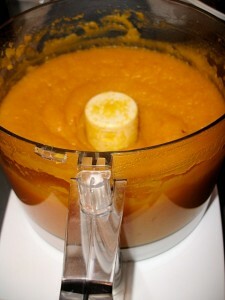 Simply steam the apples using your method of choice and puree in a food processor or blender until desired consistency. Make a large batch and freeze in individual ice cube trays. Once frozen, simply pop out the cubes and store in a freezer bag for up to 3 months. Be sure to label the bag with the contents (if making other purees you can easily confuse them) and date. The great thing about homemade apple puree is that it is not only enjoyed by baby, but can also be used in other foods and recipes for all ages. 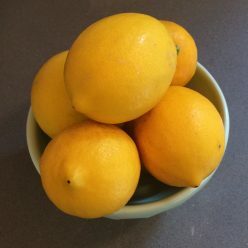 It pairs well with a bit of cinnamon to accompany grilled pork, or warmed as a healthy topping for pancakes or waffles, or as a healthy addition to increase moisture and reduce fat in muffins. Here’s the recipe for baby’s organic apple puree as well as a recipe to use extra puree in mini banana apple bran muffins. Apples are a great first food because of their sweetness and versatility. Golden and Red Delicious, as well as Fuji apples have the least amount of acid, and thus are the most tolerable for babies. You may peel apples before or after cooking. Cooking with skins on allows the apples to retain more nutrients. Steamer Method: Place prepared apples in steamer basket set in a pot filled with a small amount (about 1 – 2 inches, but not to touch fruit) of lightly boiling water. Cover tightly for best nutrient retention and steam for 10 – 12 minutes or until apples are tender. Apples should pierce easily with a toothpick. Set apples and cooking liquid aside to cool. Scrape apples for skin and puree in a food processor with a steel blade. Add tablespoons of reserved cooking liquid to puree to make smoother and adjust consistency. Microwave Method: Place prepared apple quarters in microwave safe dish. Add ¼ cup water and cover tightly, allowing a corner to vent. Microwave on high for 3 minutes, stir apples and re-cover and cook for 3 – 6 minutes or until tender. Check for doneness, cool and proceed with recipe above. An apple a day…When baby is ready for more texture, chunks on steamed apples are good finger foods. Also for teething baby, put steamed apple slices in the freezer for a soothing treat. This is an easy way to prepare fish for your baby or toddler. Because of the mild and “non-fishy” taste, tilapia is a good introduction to seafood for a little one. Fish can be thinned with reserved cooking broth, or mix with plain yogurt or cottage cheese for a more creamy texture. Heat broth in a medium skillet over medium-high heat until simmering. Add fish fillets. Broth should not cover fish, but come up about halfway. Simmer fish until opaque, 3 to 4 minutes per side. Fish should flake easily with a fork. Remove fish from pan and mash with a fork to desired consistency, or puree with some of the cooking liquid in a food processor. Forget about frozen sticks with imposter fish and fake breading. Your child deserves the real thing. Use a mild white fish for this recipe. Serve a variety of dipping options such as ketchup, malt vinegar, and tartar sauce. In a shallow dish beat together milk and egg. Put cereal in a food processor and pulse into crumbs. Or place in a self-sealing plastic bag and crush with a rolling pin. On a flat plate, combine cereal, flour, and salt. Cut fish into 8 equal pieces. Dip fish pieces into milk-egg mixture, and then dredge in cereal mixture to coat. Heat oil in a large nonstick skillet over medium-high heat. Add fish sticks to pan and cook until brown and crispy outside and cooked and flaky inside, 3 to 4 minutes on each side, turning with a spatula. Reduce heat if there is too much splattering. Pat fish sticks with paper towels to soak up any excess oil. Tip: Everyone has Os. I’ve discovered that every household with a child under five years old has some brand of toasted Os cereal. You’ll be surprised how well your child’s favorite cereal performs in recipes that call for bread crumbs, stuffing, or even nuts. Lisa Barnes is author of The Petit Appetit Cookbook and lives in Sausalito, California. I wanted to share this article with those parents who are dealing with children diagnosed with hyperactivity and attention deficit disorder. There are many nutritionists and parents who have written about the effects of diet and specifically eliminating additives and preservatives on children’s behavior and learning abilities. Now there is a study about the role of food additives and how common food additives and colorings can increase hyperactive behavior in a broad range of children. You can read the entire article here in the NY Times. It is certainly a preliminary study, but hopefully one that will raise the discussion of additive warnings, food labeling, and eliminating certain foods containing these additives in schools. If you talk to any of these parents who have children with ADHD and they’ve changed the child’s eating habits and thus altered the behavior, they would certainly say it makes not only “an impact on the child’s life” but of that of the whole family. And the idea that children will be ostracized for not eating preservative laden foods?! Is this a doctor suggesting we should all succumb to peer pressure for the risk of our children’s health and well being?! We’ve all heard the slogan, “milk, it does a body good” – but what kind of milk? While some milk is fine for some, many others, especially children are allergic or intolerant from their first drink. An estimated 30 million Americans have some kind of lactose (the milk sugar in all dairy products) intolerance, and more than 100,000 babies are thought to suffer from milk allergies.There is a difference between lactose intolerance and milk allergies. Children with lactose intolerance are deficient in lactase, an enzyme produced internally to break down lactose. This can result in stomache aches, gas and diarrhea. However children allergic to milk have reactions to some or all of the proteins: casein, whey, and lactalbumin. The adverse effects can cause gastric problems as well as skin issues such as rash, and eczema, and nasal distress such as runny nose and congestion. These reactions can come as soon as babies are breastfed (by mothers ingesting dairy products) or given milk based formulas. Babies are more likely to be born with a milk allergy vs. a lactose intolerance. The good news is that most children outgrow a milk allergy by the age of 4, according to Paul Ehrlich, M.D., pediatrician, allergist and clinical assistant professor at New York University School of Medicine. Plus he says, “the more attentive you are to keeping milk out of your children’s diet, the sooner the allergy with go away.” Although this is not always easy as cow’s milk and other dairy products are in many processed and packaged foods under the ingredient names: whey, casein, lactalbumin, caramel color, and nougat, among others. Thus it is important to read labels to avoid reactions. Organizations such as the Food Allergy Network, as well as nutritionists can help you identify and steer clear of hidden dangers. Today many people are asking which milk is the best choice for their families and children. Some households have more than one kind of milk (I know mine has organic fat free, organic 2 percent and organic vanilla soy)and milk alternative to satisfy different ages, dietary restrictions, and tastes. In addition to considering the various cow’s milk alternatives, many parents of children who can drink cow’s milk are buying organic brands to minimize the exposure of the hormone bovine somatotropin (bST) or recombinant bovine growth hormone (rbGH), which some pediatricians and nutritionists suspect as an agent of premature development in children. Another option some parents are choosing for their children and families is raw milk as some believe it is healthier than pasteurized and homogenized milks. However there is debate over the safety and quality of raw milk. Not high in protein (only two grams per 8 ounces, as compared with 8 grams in cow’s milk) this naturally sweet beverage does have some beneficial fats and calcium. Because of the smooth and creamy texture it also works well for cooking and baking. Almond milk is not an alternative for those with nut allergies. Coat’s milk has only slightly less lactose than cow’s milk, making it an inappropriate alternative to those with intolerance. However it does have different proteins from cow’s milk, so may be a good choice for some with allergies. Goat’s milk is slightly sweet and salty with a fat level and consistency similar to whole cow’s milk. This is the least allergenic milk alternative, as it is suitable for children with milk intolerance and allergies. However it is lower in protein and much thinner in consistency than cow’s milk. Young children not getting enough protein from food sources, should not substitute rice milk. Oat milk is high in fiber however low in protein. Oat milk has a slightly sweet taste and light consistency. It is highly tolerated by most kids who have soy, rice and milk allergies. However it is not acceptable for children with celiac disease or other wheat and gluten intolerances and allergies. This is high in protein and the most popular cow’s milk alternative. If you’re a vegetarian, or if your baby has trouble digesting cow’s milk protein, the doctor may suggest a soy-based formula. Although between 5 and 30 percent of children with a cow’s milk allergy are also allergic to soy – thus it is not an option for everyone. Recent research and questions have arisen over soy’s phytoestrgen levels and possible link to interferance with children’s hormonal and sexual development. Some pediatrician’s caution not to give more than 2 serving a day to children. When in doubt about milk, formula, allergies or intolerances, talk to your pediatrician or consult a nutritionist to help guide you to the safest choices for your family’s needs. Posted on June 4, 2007 Categories Lisa Barnes Blog, organicTags Baby Food1 Comment on Got (the right) milk?